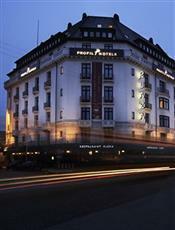 The Copenhagen Plaza is a luxurious 4-star hotel built in 1913 at the instigation of King Frederik VIII. This elegant property is located in the very heart of Copenhagen and overlooks beautiful Tivoli Gardens. The Copenhagen Plaza boasts an excellent position - just opposite Central Station with all its convenient transport connections and just 12 minutes from the airport. This unrivaled location makes it easily accessible for both tourists and business travelers. The guests will appreciate the hotels modern facilities including the elegant Restaurant Flora, the nearby fitness centre (open every day) and 5 well-equipped conference rooms which can cater for events from 2 to 40 delegates. All conference rooms present their own unique style and atmosphere. Enjoy your day of exploring the city, after having a nutritious breakfast in the hotel's breakfast restaurant Cafe Plaza. New! There is now air conditioning in all rooms!